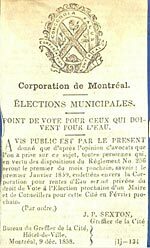 In the nineteenth century, very few Montrealers were active in political life. Maintenance of the property qualification was the major obstacle. In 1874, for example, it was necessary to own property worth $4000 in order to be eligible to run for mayor; that amount represented at least ten years’ salary for a qualified worker. As of 1860, taxpaying tenants could also exercise the right to vote, but other conditions still applied. By law, all taxes had to be paid before the first of the year and statute labor had to be completed. The limited voting hours often made it difficult, if not impossible, for workers who put in an average of twelve hours per day, to exercise their right to vote. On the other hand, richer citizens could now vote, as of 1867, in all the districts where they owned property, as well as in their district of residence. By the same token, people who occupied a place of business having a certain value also had the right to vote.